Fleep: How to Work in a Remote Team? Fleep is a distributed team. Our people work remotely from two different cities, and for most of our team members, working at home is common. So, we have our own tips to share when it comes to the oh-so-current question: how to work in a remote team? Handling the team in itself is not really an issue for Fleep, however… trying to pull all the people together virtually can be a challenge in itself. It can’t be emphasized enough how important good daily communication is for remote teams. Especially for the ones that are building a communication tool themselves. Our day-to-day business, conversations, development, bug chats and discussions all take place in Fleep. We pride ourselves for dogfooding our own product. This helps us understand best if we are building a useful product that would work for start-ups and teams similar to us and helps us pull our remote team together. And that’s the case with us as well. It’s not unusual that conversations in Fleep carry on during non-working hours in the evening or even on weekends. It’s up to the team members to decide whether they’ll respond right away or when the new workday starts, different people have different approaches, but the conversations stay there, always in sight, whenever you sign in. With Fleep it’s easy to see who has read the messages and who’s currently active in the chat as well (with our Presence features). This adds speed and relevance to the lean development efforts. Regardless of how great the chat application is, it can never really replace human behavior and honesty in real eye-to-eye conversations. In our team, whenever we see that a chat conversation is taking a wrong turn or misunderstandings arise, we call each other using Skype. Adding audio to your communication adds a special layer of trust and understanding. From someone’s voice you can easily detect if they’re agreeing with you or are hesitant and confused. Regular catch-ups and conference calls should be scheduled so that work can be fairly distributed and everyone knows what they are supposed to be doing. We have a regular weekly meeting either in-person or via a Skype call with the team during which we discuss topics that need further discussion or clarifications. We also use these opportunities to share what we did during the previous week and what we will be up to in the upcoming one. Staying in touch with the team using chats and calls is not all it takes for remote teams to feel like they’re connected. Every 2nd week we bring the whole team together to Tartu or Tallinn and make sure that people get enough time for those important one-to-one conversations. Oftentimes that is all that it takes to get on the same page and get some of those invaluable insights shared between team members. — Chad Halvorson, via Are Remote Teams the Future of Work? Apart from design talks and development discussions (read: heated conversations) it’s also crucial to make sure that the junior engineers working in the team get the chance to learn, progress and tackle the more complicated tasks together with the senior engineers who are not always co-located. This works a lot easier if the person who is helping you is sitting right next to you. It’s easy to fall out of touch with remote team members if you’re not sitting across the table with them and it’s vital from the start-up culture point of view to make sure people get the feeling of being united, whenever they come to the office or even when they don’t. 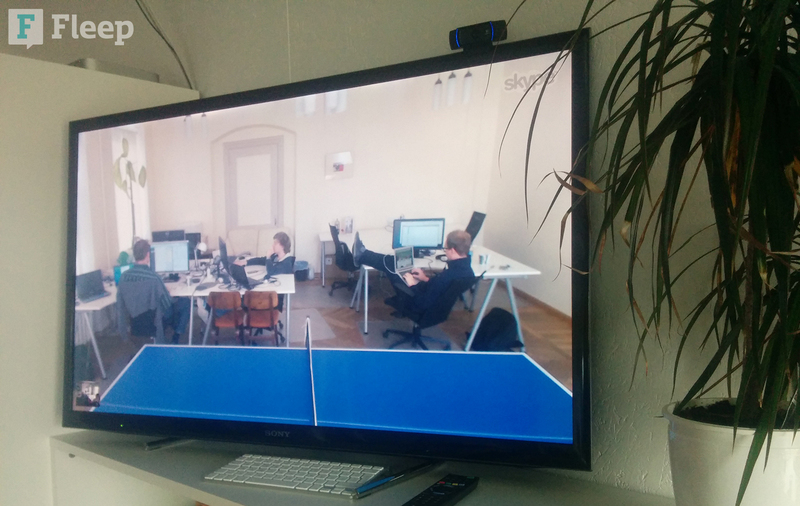 That’s why we have a continuous Skype call going on day in and day out between the Tallinn and Tartu office TVs. That way we can see if someone is in the office, if they’re currently busy or simply joke about the fact that they’re playing ping pong on the other end of the line. Ultimately, the decision about how distributed a team can be comes down to the needs of that team: do you need to talk every day? What type of people are in your team? What are the personal habits of the team members? Once you know all this, you can easily decide which of the solutions works best, or which 2-3 tools you need to make the most out of communication. We hope you found these tips useful! What kind of tools are you using to make sure the team feels united even when there’s a long distance between them? Feel free to ping us via Twitter or Facebook to share your thoughts!